Columnar stores like Amazon Redshift achieve high speeds by reading only the columns needed to complete a query. The best speedups are achieved when these columns and the intermediate results fit in RAM. These speedups degrade if the intermediate results exceed the available RAM and get written to disk. The disk space spikes as temporary tables are created and destroyed, slowing our queries in the process. Redshift keeps detailed statistics on each query execution, available in the system views svl_query_report and svl_query_summary. These tables are keyed on query with the ID found in the redshift console or by selecting from svl_qlog. The svl_query_summary view is a summarized version of svl_qlog. 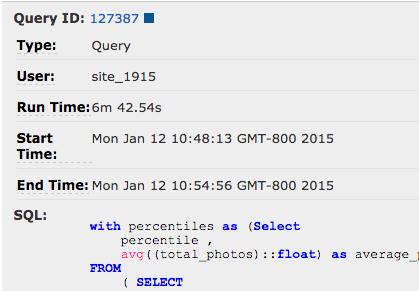 To dig in, we’ll open up our Redshift console and check the run time for our sample query. The workmem is the upper bound on memory the query planner requires for each step, not the amount actually used. If workmem exceeds the available RAM the step will use disk for intermediate results. This is indicated by the is_diskbased column. The amount of RAM available is based on the number of query slots allocated to this query. By default, Redshift uses 5 query slots and allocates one slot per query. Many of the steps are using disk so we need to optimize this query. There are always two approaches to solving memory constraints: add more memory or use less. Adding more memory is expensive and using less can be difficult or even impossible. Some queries will always need to use disk. workmem is only the estimate of space needed by the query and is based on the statistics the database collects about each table. Make sure to run analyze on your tables to keep their internal statistics up to date. This reduces extraneous padding from outdated row count estimates. Adding more memory is done by either adding more nodes to your cluster or by increasing the wlm_query_slot_count. This can be done per session using set wlm_query_slot_count or per user using parameter groups. Increasing the wlm_query_slot_count from 1 to 5 gives this query access to all of the cluster’s RAM. The workmem has increased for all steps, and most are no longer disk-based. Requiring all of the query slots means that this query needs to wait until all 5 slots are available before it can run. This waiting can eliminate the performance improvements of the additional RAM on a busy cluster. This query counts the distinct number of users who have post or visit events each day. It takes 75 seconds and four of its steps are disk-based. Instead of increasing the query slots, let’s make the query more efficient. The best way to improve the performance of any query is to reduce the amount of data that is stored and read during its execution. This query only cares about visits with an event_type of ‘Post’ or ‘Visit’. Everything else will resolve to null and not be counted in the distinct. Adding a where clause to filter for only these two event types greatly speeds up this query. It runs in about 5 seconds and doesn’t hit the disk at all.